While travelling through the Lake District you may suddenly come across a field full of cars, with men and women standing with binoculars in hand, a line of people will be shouting and cheering, calling out names and blowing whistles. You may wonder what you have stumbled upon, and then you realise that this is one of Cumbria's oldest and most popular sports - Hound Trailing. 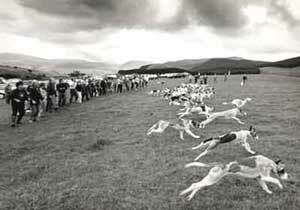 Racing takes place over moorland, fields and fells, the hounds following a trail made of a mixture of paraffin and oil of aniseed. Two trailers carry rags to the halfway point and then walk away from each other, one towards the start and one towards the finish, laying the trail. As the race unfolds many of the owners and spectators lay bets with the bookmakers who are a permanent part of the trailing fraternity. When the timekeeper shouts "trail", the race is close to finishing, and the betting stops. The first dog to cross the line wins. Judging the result of a hound trail can often be a close call, with a video camera 'photo finish' sometimes used to decide the result. Anybody wanting to participate in the running of hounds must be a member of the association and have their hounds registered. Some owners like to breed their own puppies; others buy them from a breeder. Puppies begin their training at 6 months and by the end of the year they are racing on practice trails against other pups. By the start of the season proper in April they are ready for the real thing. SENIOR CHAMPIONSHIP 2018 Final placings. PUPPY CHAMPIONSHIP 2018 Final placings.